YouTube has countless hours of entertainment, videos, and TV shows to keep you and your kids entertained, but there is some content on YouTube you might not want your kids or even yourself to see. 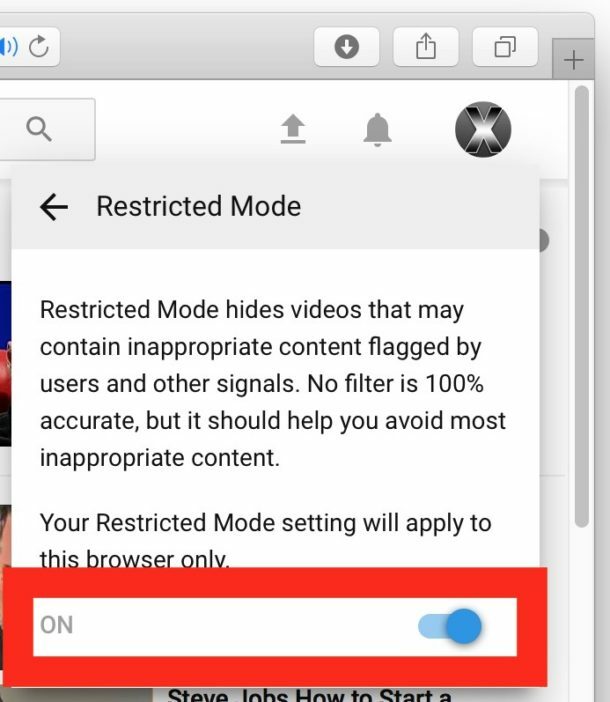 YouTube offers what is basically a parental control feature called Restricted Mode, which effectively avoids most inappropriate and offensive video content on the YouTube service by filtering it out. 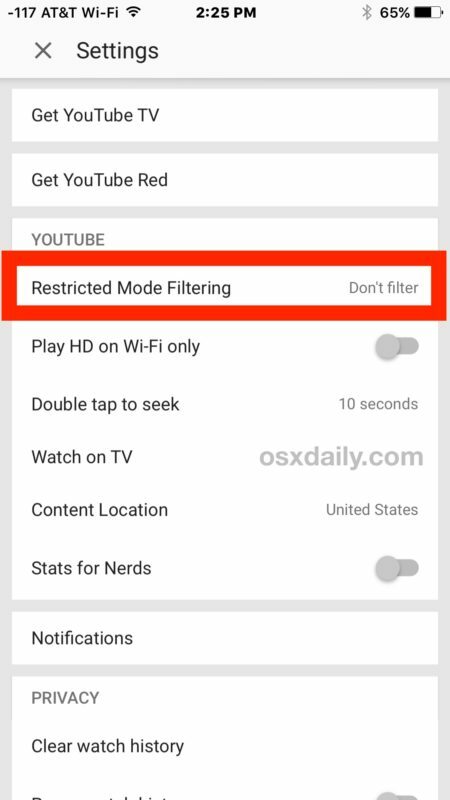 We’ll show you how to easily enable Restricted Mode on YouTube, this will filter out most of what parents and many adults don’t want to be seen and greatly help to avoid inappropriate videos on the service. 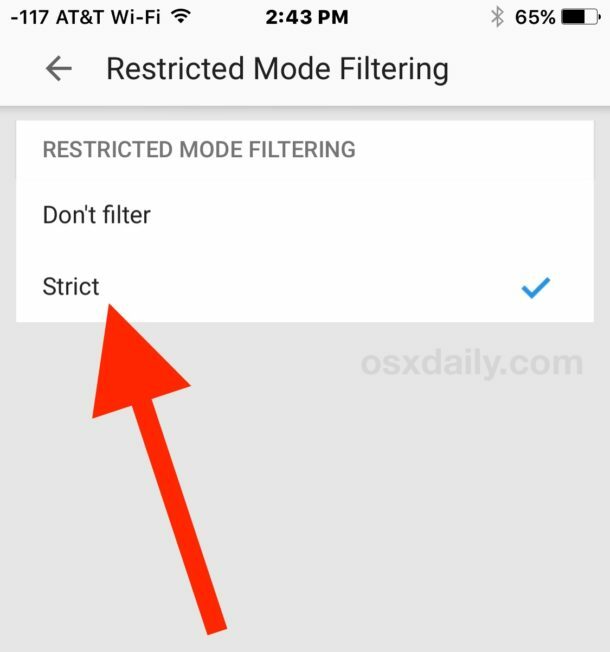 While the filtering feature is the same, enabling Restricted Mode is different on many devices, including the YouTube app on iPhone, iPad, iPod touch, Android, and the YouTube website on various web browser and Chrome for Mac and Windows. Not to worry, we’ll cover each method separately. By the way, another trick that is helpful for many parents is to loop a YouTube video if they only want a particular video to be seen and not wander off into other video material on the service. Another somewhat related helpful tip is to turn off YouTube autoplay videos which can sometimes lead down to unwanted video viewing as well. Know of another parental controls method to restrict certain videos on YouTube? Have any other great YouTube tricks? Let us know in the comments! So any instructions for Apple TV 3, 4? Just make sure you understand that “Restricted Mode” has nothing to do with violence, etc. It mostly filters out certain political opinions, so that Google can gain a monopoly on that too. Channel qu**r for kids isn’t filtered. The Young Turks aren’t filtered (lots of ‘bad’ language). Most of videos with almost naked girls/boys aren’t filtered. What is filtered? Well, political channels with opinions that aren’t those of google. So keep that in mind when using restricted mode. Do better YouTube! Give parents options to filter out gore and violence! My kid just wants to watch DanTDM Minecraft videos, but is exposed to stuff like Happy Wheels with blades slicing bodies in half, slicing off heads with blood spurting out. Not ok for an 8 year old kid! Restricted Mode is barely any help at all.